The radical Islamic sect, Boko Haram seems to be considering dialogue with the Federal Government of Nigeria as state owned Nigerian Television Authority [NTA] reports that some alleged members of the sect have named some northern leaders to negotiate with the government on its behalf. The sect which has been responsible for series of attacks across the country earlier launched multiple bomb attacks on Division I of the Nigerian Army in Kaduna, so far no deaths have been reported except for the suicide bomber who disguised as a military officer due to swiftness of the Army officials. 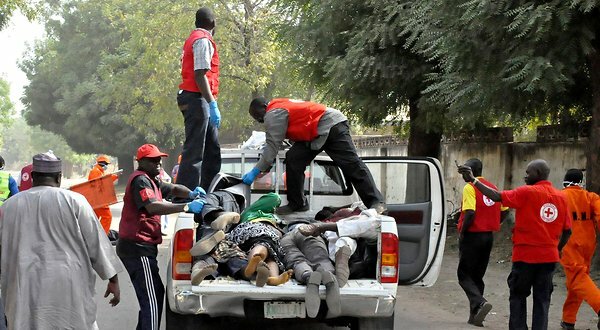 It would be recalled that after the Kano state Police Headquarters bombing which claimed lots of lives including that of the Kano State Correspondent of private owned Channels Television; Enenche Akogwu, the Federal Government offered to negotiate with the Islamic sect to put an end the unnecessary killings of innocent Nigerians but the sect has to identify itself before talks could commence. The veracity of the video has not been verified by security agents but those named in the video on the National TV NTA, are: Sheik Abubakar Gero, Dr. Shettima Ali Monguno, Alhaji Ali Bukar Ibrahim, the former governor of Yobe state. The fourth name listed was not clear in the video to be identified. According to local news agency, Vanguard, findings reveal that Boko Haram leaders have disowned the list of negotiators and that the said video did not originate from its organisation. The tape which NTA claimed was delivered by an unidentified source featured two figures, fully masked in black. Only the voice of one was heard, while the other was silent. “We here confirmed and accept the reported initiative of the President for a dialogue as a welcome development”, the speaker who did not identify himself said. According to him, the group trusts the named leaders and said “the decision taken by these people can actually change the whole situation”.